The fireplace surround features a custom concrete finish by Marezzo, Ltd. and black wood panels, creating a unique focal point in the great room. If these walls could talk, the stories they would tell! But since talking wall technology has not yet been invented, the owners of a 4,500 square-foot custom-designed ranch home in the Fox Chapel area incorporated many personal items and decorative elements in their home to communicate their story through design. Virtually every room has elements and items that hold special meaning for the family. Even the style of the home reflects both the husband and wife’s tastes. 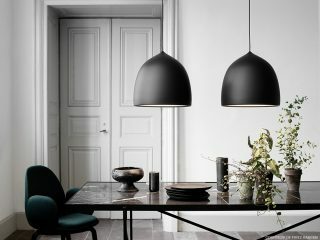 The ultimate look is a blend of the husband’s desire for industrial with the wife’s desire for contemporary and sleek. 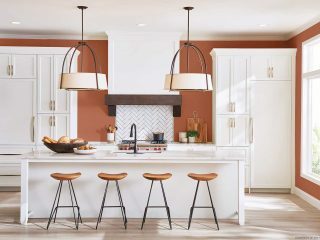 As the couple errs on the eclectic side of contemporary, the homeowner says she would call the style “contemporary with a twist.” The family utilized neutral colors throughout the home, reflecting the contemporary nature of the house and the desire to incorporate natural elements. 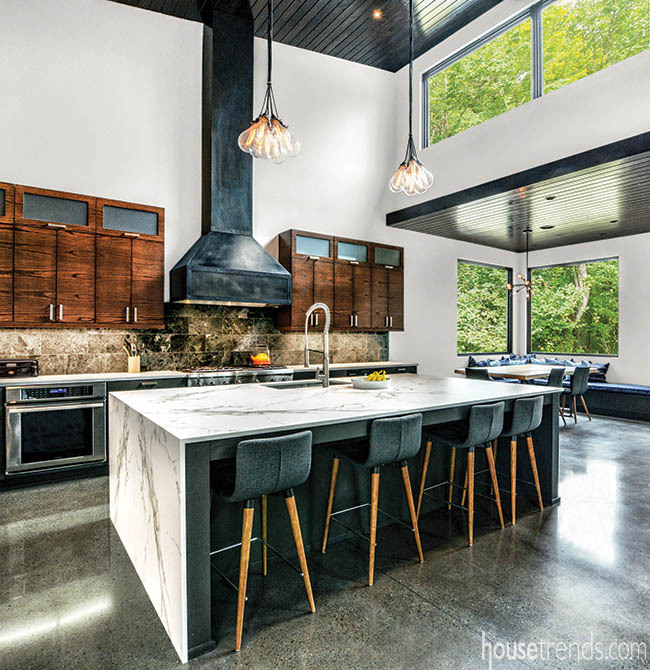 Set on a secluded, 35-acre wooded lot, the modern home is intended to integrate the outdoors, both from an architectural and an interior design standpoint. Windows highlight virtually every room, except the powder room. 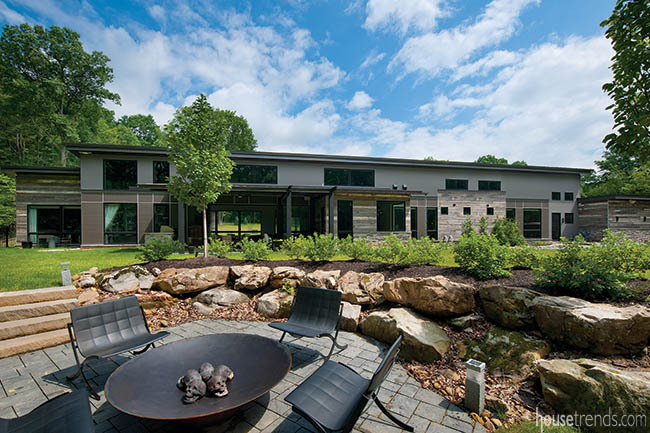 “One of the key organizers for how we arranged the house with the site was a very linear form running east to west, which optimizes daylight and views from the house,” says architect Robert Gaskill, owner of Gaskill Architecture, who spearheaded the project. The exterior of the home also reflects the harmony between the indoors and outdoors. “The exterior facade was designed to create a layered effect, expressing the different spaces with a mixture of wood siding, concrete, metal and glass,” says Gaskill. The roofs are designed so that they slope from the south, which is the high side down to the north. “This allowed for higher windows on the south side, which improved day lighting and maximized views into the woods,” he says. 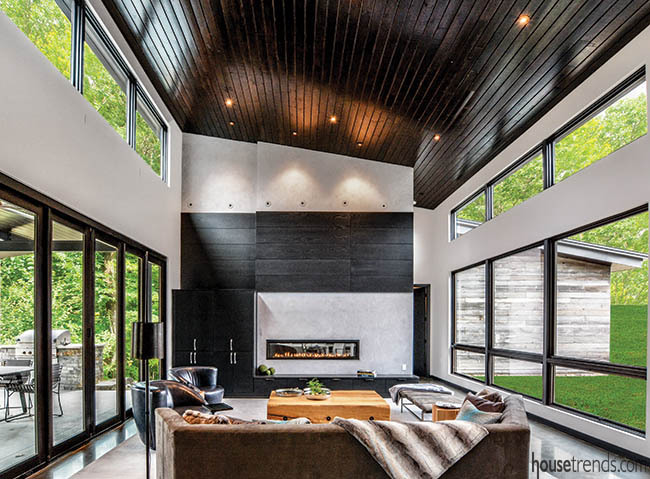 From there, Gaskill arranged the intimate and efficient floor plan so that the center of the home was the great room, providing the most transparency and views, as there are windows on both sides of the space. Walking through the vestibule area between the front and main doors to the interior, visitors might be able to tell that the family loves astronomy by the moonstone mirror suspended from the walnut feature wall. 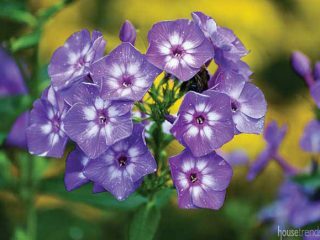 “For me, the important thing is the home looks like the people who live in it,” says Kristen Hancock, Associate ASID, owner of LMNTL DSGN, who worked with the owners to design some of the home’s interior elements. Sara Hardy, an interior designer with Gaskill Architecture, completed many of the interior design elements. 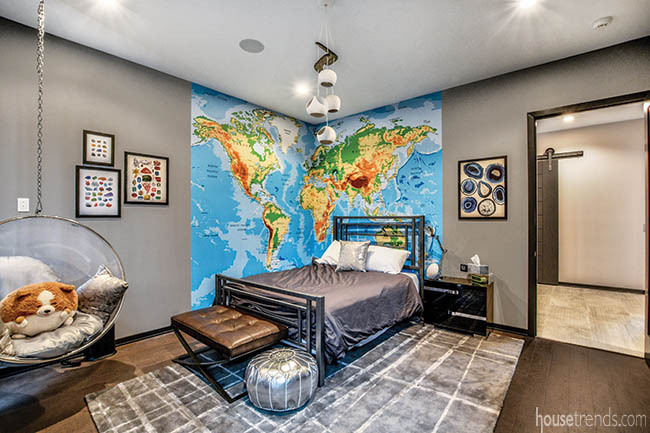 “The homeowners were open to creating so many out of the box designs, it made this experience nothing short of inspiring,” says Hardy. An open concept floor plan was the goal, as the homeowners often entertain friends and family. 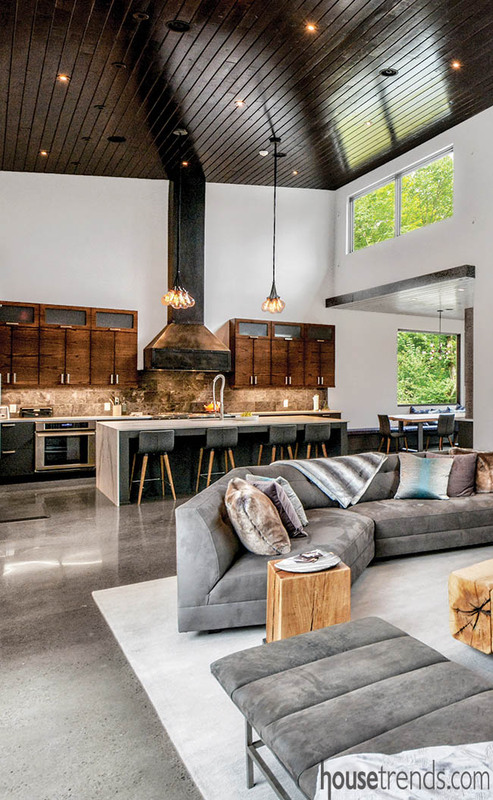 Since the home was designed to capture a glimpse of the great outdoors, the family and guests are rewarded with spectacular views of nature from the great room and adjoining kitchen. The kitchen island serves as the centerpiece, featuring an asymmetrical waterfall Dekton countertop offering plenty of space for food preparation. 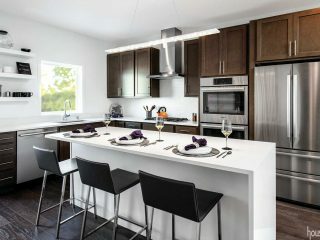 To offset the stillness of the white Cambria quartz perimeter countertops the designers added a black marble backsplash. Two-toned, custom oak kitchen cabinetry, suspended over state-of-the-art modern appliances, provides ample storage space. 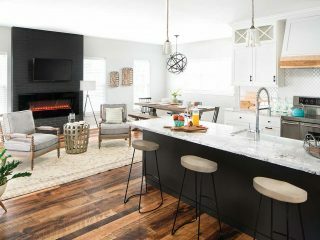 The home is without a formal dining room; rather, a table built out of trees removed from the property is set back against the wall of the kitchen, along with comfortable bench seating. 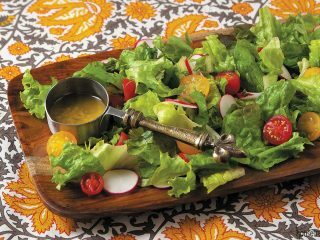 “We opted not to have a dining room because we are not a formal family, so we have an eating nook off the kitchen. It was one of the best decisions we made,” says the homeowner. 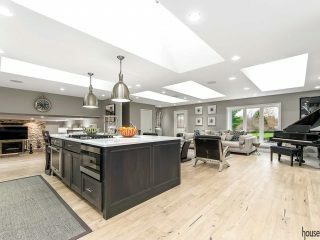 The kitchen overlooks the bright, open great room, which is flanked by tall windows and shows off contemporary furniture. Walnut from the lot enjoys a second life as a 1,200-pound coffee table. Surrounded by a custom concrete finish, the unique two-sided linear fireplace separates the great room from what is arguably the pièce de résistance of the entire home—the library. 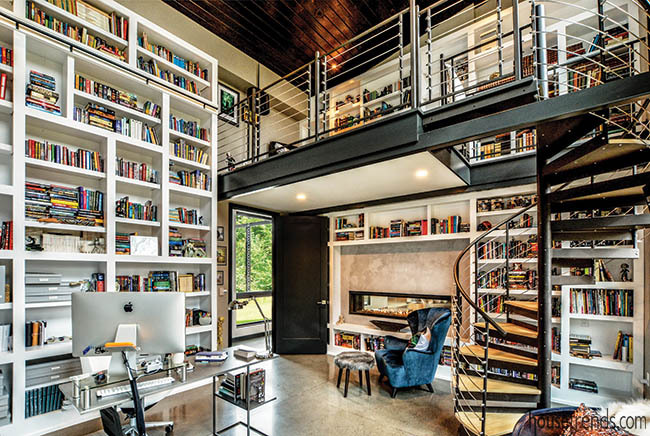 Perhaps the crown jewel of the home, at least for the homeowner, who is an author of horror novels, is the enviable, extraordinary library, a peaceful sanctuary that pulls double duty as the homeowner’s private office. “Books are such a big part of who I am, so when we started talking about me having an official home office, I needed a place to put all my books. We realized it would have to be pretty immense,” says the homeowner. Like the rest of the home, the library has comfortable and modern elements. Decorative touches, such as a zombie hand tie back on the custom window treatment, is a subtle nod to the homeowner’s occupation. “It was important for her to feel inspired in the space and important to do work and to be comfortable,” says Hancock, as well as making sure the space did not obstruct her workflow. A spiral staircase is the only access point to the small loft, where a cozy chair is tucked into the corner, providing another reading nook with spectacular views of the outdoors. Floor to ceiling shelves house a myriad of books, which are organized in an elaborate system. “We spent the better part of two weeks putting books away in the right order on that ladder system,” says Hancock. The dogs’ importance in the family’s lives is evident throughout the home, including in the master bedroom. Hancock designed a built-in custom pack bed for the dogs, situated at the base of the owners’ platform bed, so that the dogs can easily move between the two. 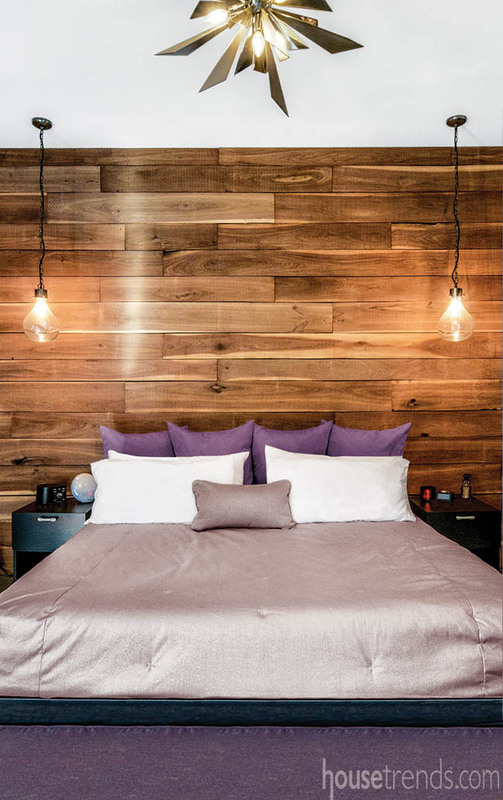 Rather than having a headboard, the homeowners had the walnut milled from the trees on the property and installed behind the bed wall. “Who wouldn’t want to wake up to that view?” says Hancock. 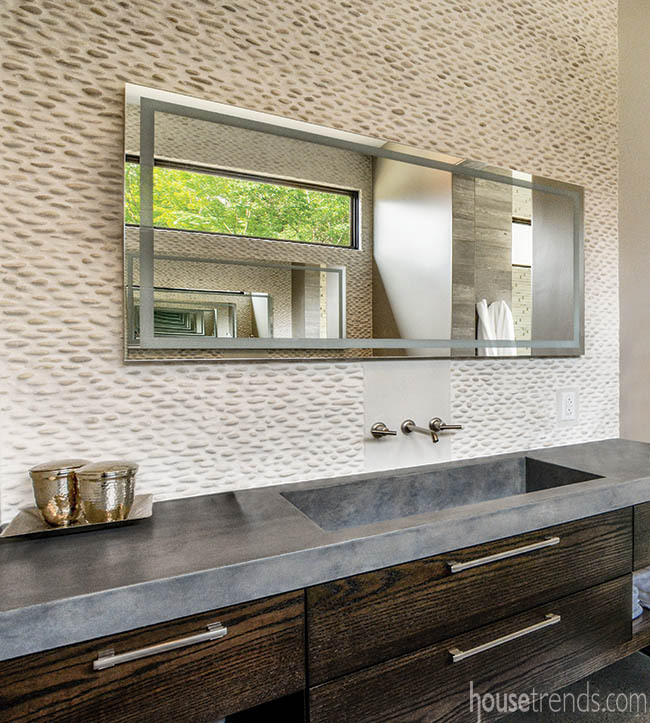 They used natural materials in the bathroom, such as a pebbled backsplash and wood-look plank tile on the walls. 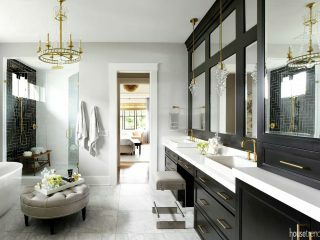 The main room of the bathroom features his and hers floating custom vanities, concrete countertops with integrated sinks, wall-mounted faucets, and backlit mirrors. 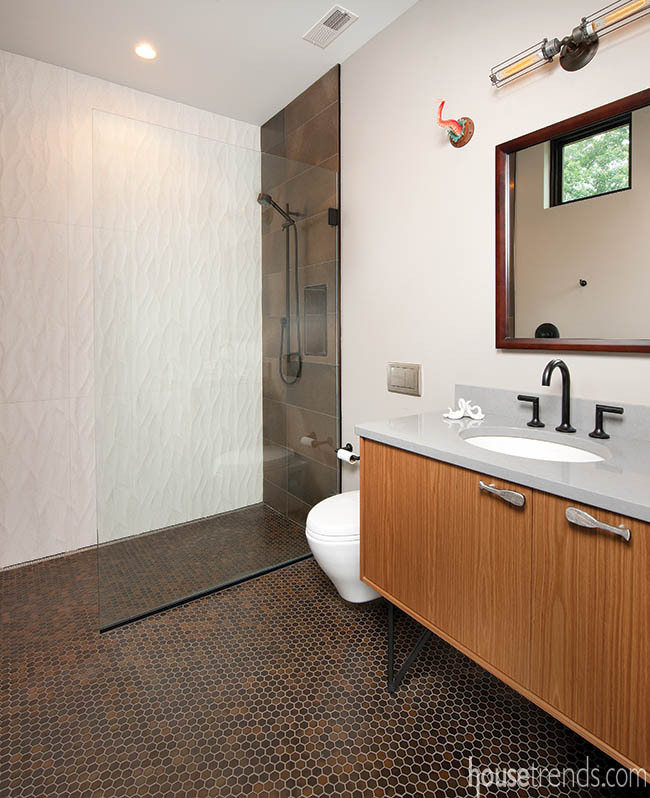 The freestanding tub in the wet room overlooks the property and sits opposite the oversized shower. 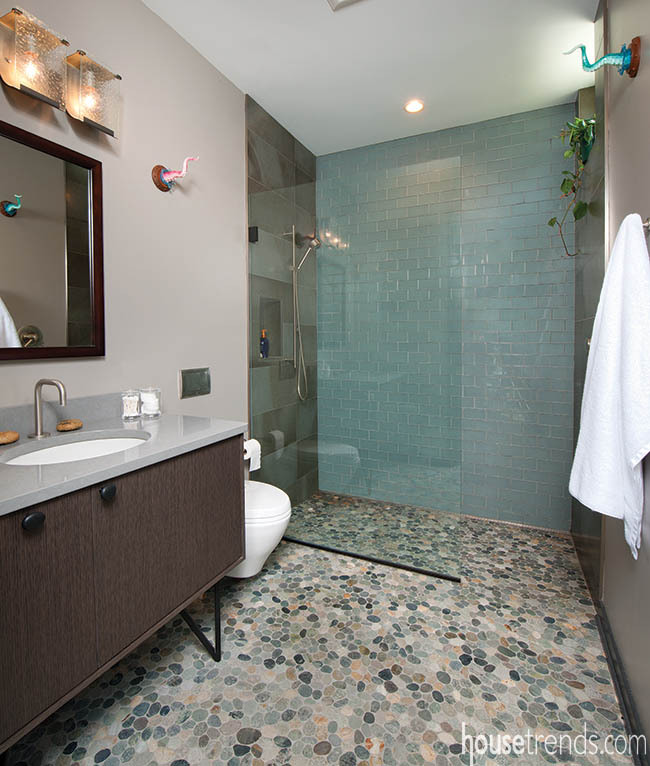 The tub, which was one of the first decisions made by the homeowners, has a contemporary twist, and is tucked in front of two walls covered in quarried dimensional stone, which helps to create a natural look without becoming rustic. 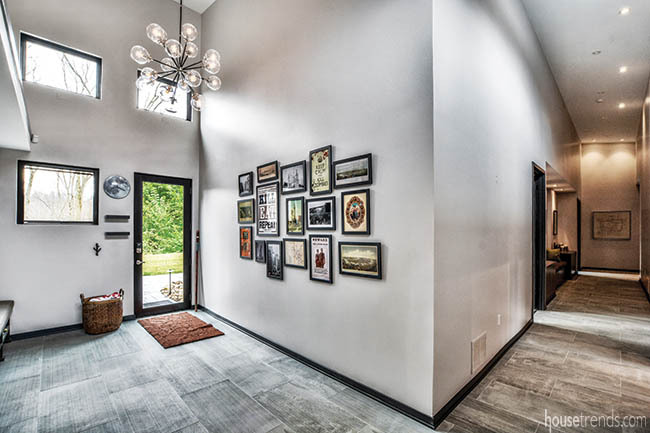 The flooring throughout the home is varied, with about half the house, including the great room, kitchen, library and master suite, featuring concrete floors. Everything else is a mixture of tile, cork or engineered hardwood. 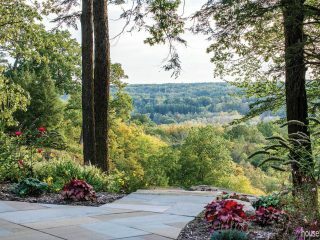 At the homeowner’s request, the builder incorporated sustainable elements, such as a geothermal system for all of the heating and cooling, radiant heat concrete floors, and water filtration around the house incorporated with bioswales and vegetation that collect rainwater from rain chains. 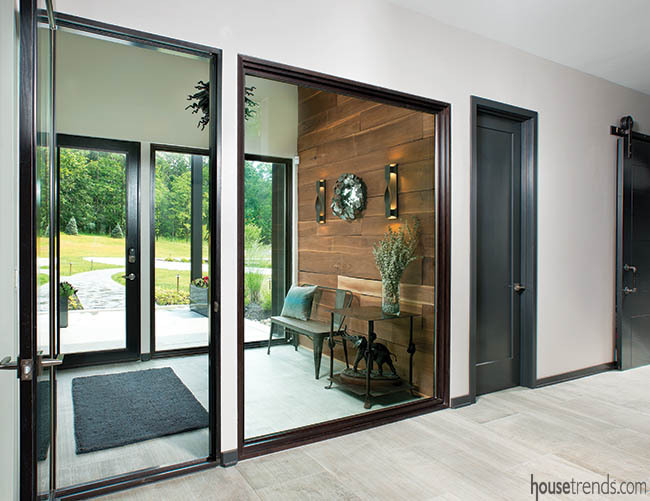 As the homeowners intend to age gracefully in their home, they wanted it to be fully accessible, now and in the future. To achieve this, as well as to accommodate their short-legged dogs, a one-level home was a must. 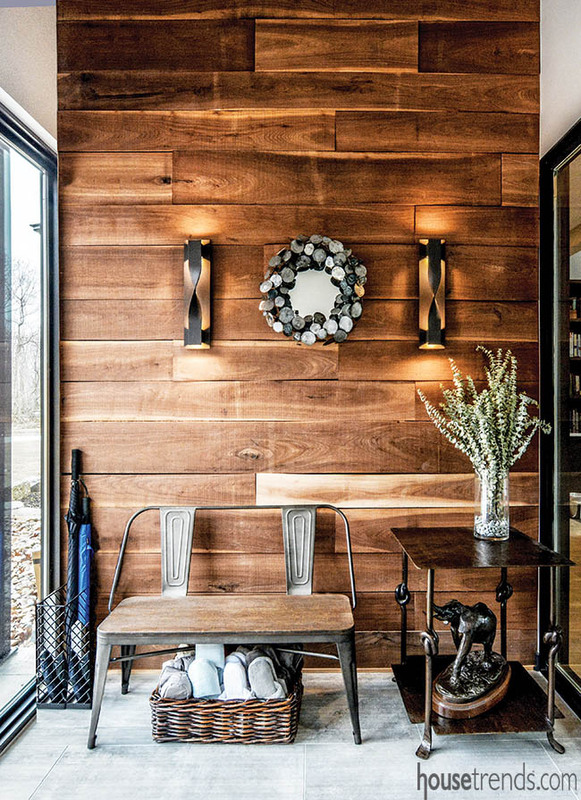 As part of bringing the outdoors inside, reclaimed wood is found throughout the home, such as some of the flooring, walnut accent walls, and furniture pieces. A good portion of the exterior wood siding, for example, was salvaged from a 100-year-old barn. 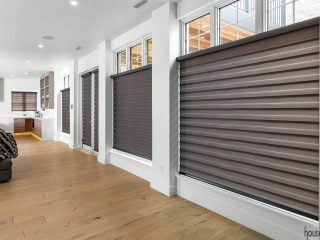 The home building process was truly a collaborative effort, as the team came together to create a you-have-to-see-it-to-believe-it kind of home. The owners’ dogs are members of the family, so it is only natural that they have a room devoted to their needs, including a dog bath enveloped in black subway tile, cubbies for leashes, and Thibaut’s Best in Show dog-themed wallpaper. Family memories are made in the game room, featuring a large screen flanked by black oak cabinetry, cozy seating, a table for games, and a spiky Hudson Valley chandelier resembling a sunburst. The author’s penchant for the horror genre is reflected in the galleries on the mudroom walls, depicting zombies and a Godzilla takeover of Pittsburgh. An oversized bench, cubbies and tall cabinets with wire mesh grille inserts offer plenty of storage options for the busy family. Even if doing laundry is your least favorite chore, you can’t help but fall in love with this appealing space. 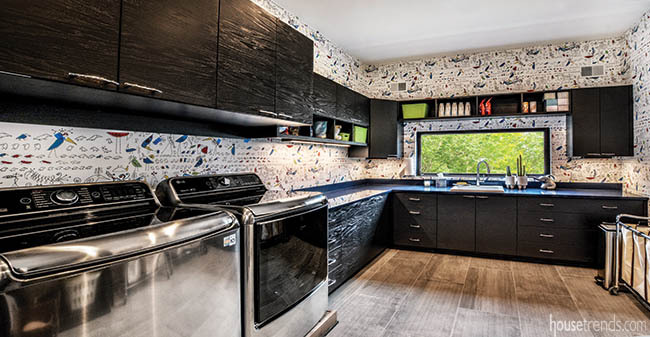 Concrete-inspired tile floors, a stainless steel washer and dryer, a sink for hand washing items, Schumacher’s Birds and Butterflies wallpaper, and black oak cabinetry round out a modern and spacious laundry area, complete with a view of the yard. 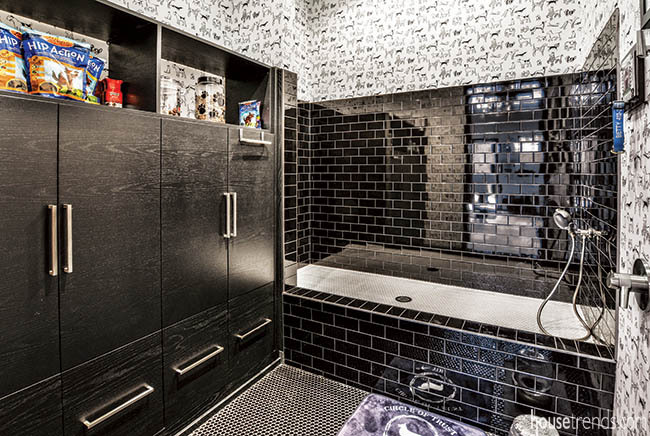 The New York City subway doesn’t stop in Pittsburgh, but you would never know it by the looks of this powder room. 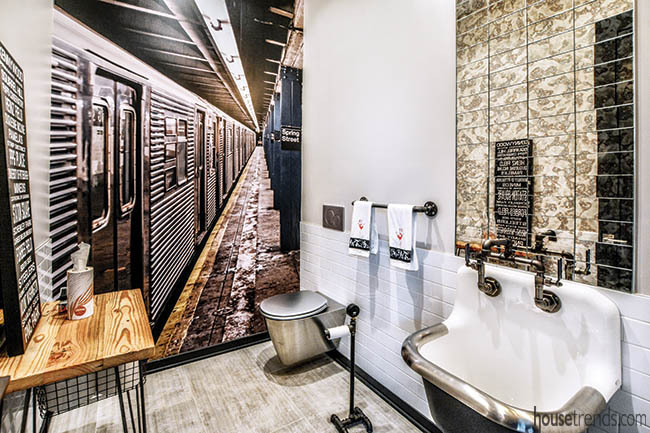 The eclectic room evokes a glamorized subway feel thanks to its antique mirror subway tile, stainless steel toilet, wall-mounted janitor sink, and a mural depicting a New York subway station created by MegaPrint.